Zimbabwean exiles in the UK are to stage another demonstration on Friday outside a clinic in Nottingham run by a doctor who is attempting to seize a farm in Zimbabwe. He and his wife Veronica, who is related to Grace Mugabe, are trying to kick out the owner Philip Rankin, who bought the farm with the approval of the Mugabe authorities. He has been besieged in his home by hired thugs unable to care for his tobacco crop worth up to £240,000. The demonstration is organized by the Zimbabwe Vigil, which has been protesting outside the Zimbabwe Embassy in London every Saturday since October 2002 in support of human rights in Zimbabwe. The Nyatsuros have made legal threats to try to stop press coverage of their outrageous behaviour. The Daily Telegraph here in the UK dropped a report it had carried in their print edition from their website. The Times was braver: it still carries its report on the Times website but with the disclaimer: ‘This article is the subject of a legal complaint from Mrs Veronica Nyatsuro’. Date and time: Friday 13th November from 12 noon – 3 pm. Contact: Chamunorwa Chisuko 07832920609, Enniah Dube 07403439707, Fungayi Mabhunu 07907089899. The attempt by a British GP to seize a farm in Zimbabwe was condemned by Ephraim Tapa, founder member of the Zimbabwe Vigil and President of its sister organisation Restoration of Human Rights in Zimbabwe (ROHR). Ephraim was speaking after some 50 Zimbabwean exiles and supporters demonstrated during the week outside the clinic in Nottingham run by Dr Sylvester Nyatsuro who has been in the UK more than 10 years and has been given British citizenship. The activists displayed posters reading: ‘Down with farm looter Dr Nyatsuro’, ‘No to Mugabe supporters in UK', 'Dr Nyatsuro: Closet racist' and 'Stop farm looting in Zimbabwe'. Ephraim accused Dr Nyatsuro of hypocrisy in trying to grab a farm from a white Zimbabwean farmer. In an interview with Voice of America he said that Dr Nyatsuro’s British citizenship must be revoked. ‘You can’t have it both ways. No to cronyism and no to tourism farming.’ Ephraim said the demonstrators would be back again unless Dr Nyatsuro dropped his attempt to steal the farm (see: http://www.voazimbabwe.com/content/zimbabweans-protest-over-doctors-attempt-to-take-over-white-farmers-land/3026371.html). Ephraim was also video-interviewed at the demonstration by Sally Mutseyami (see: https://drive.google.com/file/d/0B-jNDrZYdjg2Q2FYekdhT2ZKLWc/view?ts=563245a3). Dr Nyatsuro’s wife Veronica, who is related to Grace Mugabe, is the clinic’s practice manager and angrily ordered one of the protesters off her property when he started handing out leaflets. She didn’t seem to have much grasp of property rights as he was on the pavement. He advised her to call the police which she did. Unfortunately for her the police didn’t support her effort to claim ownership of the pavement. The day before the demonstration someone calling herself Margaret Magwedi and sounding very much like Mrs Nyatsuro had phoned the people listed in the media release publicising the demonstration. She said she was from an organisation called ‘the Zimbabwe pressure group’ and wanted to attend the demonstration but was phoning us to advise that it was illegal and that the white farmer involved had gone to court and withdrawn his allegations and apologised. · Deidre Rankin: How did the protest go today. Seems various other tactics are now being used to get the farm... Plse speak to Ben for updates. Keep up the good work . . . and thank you. · Zimbabwe Vigil: Hi Deidre. We just posted a demo report on the page wall. If you need any more info, please let us know. Will be sure to speak to Ben about any updates. · Deidre Rankin: TATENDA to you all. Our family really appreciates your support against blatant racism in our beloved Zimbabwe. · Zimbabwe Vigil: Thanks Deidre. Very happy to support you and your family. · Deidre Rankin: You have been wonderful. The thugs are still there and really partied last night. But we are hopeful that the matter will be resolved somehow. I believe a journalist received threatening calls about defamation as some of you also did. Thanks again. The incident confirms the Vigil’s fears that Zanu PF has become emboldened by the ease with which it can operate in the UK, where the Parliamentary leader of the popular Green Party, Caroline Lucas, is on record praising Mugabe. The group we believe are working for Zanu PF to disrupt the Vigil were back again today. Known by our supporters as the Zanu Vigil we took some pictures of them and their expensive new car which can be seen on our flickr page labelled Zanu PF Disruption Vigil: https://www.flickr.com/photos/zimbabwevigil/albums/72157660585079622. The photos of the actual Vigil can be found here: https://www.flickr.com/photos/zimbabwevigil/albums/72157660199555610. The disrupters haven’t bothered us recently but we suppose they are back because they have been infuriated by the wide publicity given to our Nottingham protest. We are writing to the police to distance ourselves from the aggressive way they importuned the public. The Zanu PF Vigil say they are planning a copycat demonstration at Dr Nyatsuro’s surgery in Nottingham – probably to reassure him of Zanu PF’s support. We ourselves will be back there on Friday 13th November if he hasn’t dropped his attempt to seize the farm by then. · The Vigil was saddened to hear of the sudden death rof a good friend Barnabas Masvaure yesterday. He had been attending the Vigil for years. We were hoping to take a collection for his family but because of the Zanu disruption we were unable to do this. We will take a collection at our next Vigil. · Thanks to those who came early to help set up: Barbara Kachidza, Bernadety Gumbanjera, Catherine Musa, Chipo Parirenyatwa, Clemence Munyukwi, Emmaculate Tshuma, Ephraim Tapa, Eugenia Mushonga, Farai Gumbanjera, Fungayi Mabhunu, Grace Rukure, Mncedisi Ndlovu, Pearl Shambare and Sharon Moyo. Thanks to Sharon for looking after the front table throughout the Vigil. Thanks also to those who stayed to the end to help pack up: Catherine Musa, Chipo Kamhunga, Dennis Benton, Ephraim Tapa, Flemming Diza, Fungayi Mabhunu, Ishmael Makina, Jean Kawara, Jeremy Mupeti, Lipi Mhlope, Patricia Masamba, Rashiwe Bayisayi, Rose Benton and Sharon Moyo. · Zimbabwe Yes We Can meeting. Saturday 7th November at 12 noon. Venue: Strand Continental Hotel (first floor lounge), 143 Strand, London WC2R 1JA. For directions see below. · Zimbabwe Action Forum (ZAF). Saturday 7th November from 6.15 pm. Venue: Strand Continental Hotel (first floor lounge), 143 Strand, London WC2R 1JA. From the Vigil it’s about a ten minute walk, in the direction away from Trafalgar Square. The Strand Continental is situated on the south side of the Strand between Somerset House and the turn off onto Waterloo Bridge. The entrance is marked by a sign at street level. It's between a newsagent and an optician. Nearest underground: Temple (District and Circle lines) and Holborn. · Monthly Itai Dzamara protest. 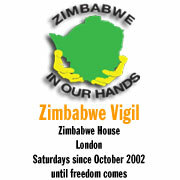 Saturday 7th November from 2 – 6 pm outside the Zimbabwe Embassy in London. The protest is to mark eight months since Dzamara’s abduction by intelligence agents.